The government's City Deals initiative should be welcomed, but questions remain about accountability. 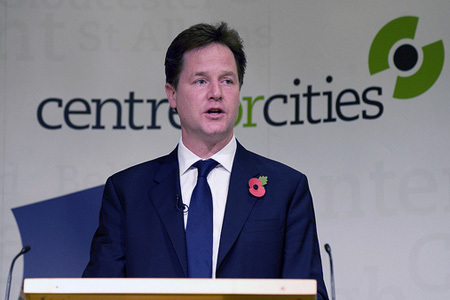 The government’s City Deal initiative, designed to spur local economic growth, will be extended to 20 further city-regions, deputy prime minister Nick Clegg has confirmed. “Our problem, over recent decades, has been a narrowing of the economic debate. The focus has been almost exclusively on London-based services as the principal source of UK growth, he said. Wave 1 City Deals were made last year with the eight core city areas: Greater Birmingham and Solihull, Bristol and the West of England, Greater Manchester, Leeds City Region, Liverpool City Region, Nottingham, Newcastle and Sheffield City Region. Each package is different. Some areas have gained the power to implement tax increment financing – borrowing against future business rate income – to finance infrastructure projects. Others have seen public spending streams merged to better leverage private sector investment. Others still have been allowed to remodel local approaches to skills investment, apprenticeship programmes and in how they respond to ingrained local problems with youth unemployment. Now Wave 2 deals will go ahead in the Black Country, Bournemouth and Brighton and Hove as well as a number of other regions. In all, 67 per cent of England’s population – and 64 per cent of its jobs – will be covered by a city deal area. Yet the policy is effectively the inverse of New Labour’s view of localism. Under Labour, it was resources rather than powers which were transferred. Devolution of cash usually came with central government performance strings attached. Whitehall kept an ever-watchful eye. Under the coalition, significant new powers are being localised, but they invariably come without extra resources. Clearly, splicing the best of both approaches is preferable. However the other major concern with city deals is over who decides how the new powers are used. In most instances, it is Local Enterprise Partnerships who will exercise them. As unelected partnerships, dominated by local big businesses, this approach is effectively the privatisation of economic development, leaving lingering questions about accountability and conflicts of interest. In the previous round of city deals, some corporate leaders were open about now being in the driving seat when it comes to deciding how public money is used in order to drive growth. Welcoming Sheffield City region’s City Deal last July, LEP chairman James Newman said the deal on skills funding “gives businesses unprecedented control over the way in which our skills system works”. So far there has been little debate about the boundary between what it is legitimate for the public purse to finance in order to stimulate the private sector and what businesses should be paying for themselves. For instance, the abiding problem we have in skills policy is that 41 per cent of employers do not train their staff, according to the Commission for Employment and Skills Employer Skills Survey for 2011. Ensuring that public money is spent on value-adding support and doesn’t replace investment which should be rightly coming from businesses remains a key challenge. City deals also need to be fair deals – for the taxpayer.